It’s Summer and it’s Hot! When is it too hot for my horse and what should I do about it? Here’s why it is important to pay close attention to your horses during high temperatures in the summer months. A normal horse’s body temperature is less than 101.5F. When your horse’s temperature rises and they are unable to lower their body temperature on their own, heat stress starts to occur. Clinical signs of heat stress include panting, stumbling, and not sweating as much as expected, with elevated body temperature, depression, seizures, coma, and death if the appropriate action is not taken. Horses lose about 25% of heat while they exhale air, so the rapid respiratory rate aides in decreasing body temperature. Additionally, sweating removes 25-30% of body heat; horses that do not sweat (anhidrosis) can have major complications in summer months. Early intervention to avoid heat stress is essential in the hot summer months. Steps to avoid heat stress: monitoring your horse’s daily water consumption; if your horse has a decrease in water consumption, add in table salt or electrolytes to increase drinking. If horses are in continuous work and sweating often, be sure to add electrolytes daily to their diet either by grain or water (if added to water be sure to have a clean bucket of water available as well). In cases of heat stress, rehydrating the horse and lowering its body temperature are essential. The best way to lower your horse’s body temperature is to apply cool water and scrape it off; do not leave the water on the horse as it acts to hold the heat in. 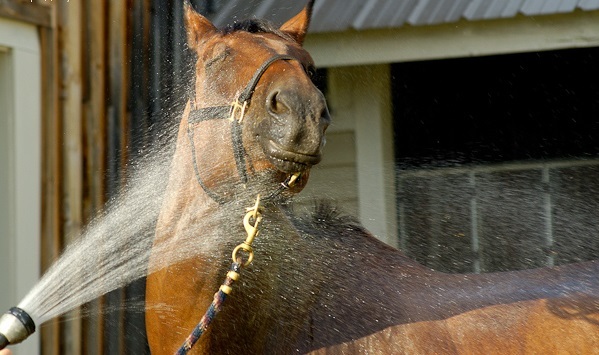 Hosing your horse off repeatedly and too quickly can cause shivering, so be cautious. After scraping off the water, stand your horse in front of a fan to allow for the surrounding temperature to be cooler, to aid in the excessive heat leaving the horse’s body. If your horse is not drinking adequately on its own, your veterinarian may need to administer oral and/or intravenous fluids. Heat stress or heat stroke is a veterinary emergency and requires immediate attention. Knowing when your horse maybe more susceptible to heat stress allows you to decide on the best time of day to exercise or postpone exercise altogether. The most commonly used predictor of heat stress is adding the ambient temperature (in degrees Fahrenheit) and relative humidity (percent). Greater than 150: heat loss is severely compromised, especially if humidity is greater than 50% of the total. Be cautious with exercise, monitor sweating and respiratory rate. Give lots of breaks. Greater than 170-180: little heat loss can occur, recommend not exercising horses if possible. Monitor for signs of heat stress if exercised during and after. For further questions about the heat or other concerns, feel free to contact your veterinarian at Fox Valley Equine Practice, by phone at (630) 365-5600 or send us an email at FVEP@FoxValleyEquine.com.